Amongst the turmoil generated by Argentine President days ago suggesting he will modify Argentina’s Glacier Law to allow mining, Federal Circuit Court Judge Sebastian Casanello has indicted three former Environment Ministers and the former head of Argentina’s glacier institute (the IANIGLA) for violating Argentina’s glacier protection law largely centered on Barrick’s Veladero and Pascua Lama Projects. The indictment raised the ante once again in Argentina’s ongoing controversy over whether to allow mining companies free reign over glacier and permafrost areas. Judge Casanello through more wood into the fire by indicting three past federal environment ministers (Mussi, Loruso and Judis) because according to his judicial investigation, they: 1. failed to carry out glacier inventories at sites where mining projects were underway or planned (such as at Barrick’s Veladero and Pascua Lama projects), 2. failed to press for the completion of the National Glacier Inventory (underway by the IANIGLA since 2010, but long overdue as of 2015), 3. failed to intervene and/or stop activities (such as mining projects) that could harm glaciers or periglacial areas, 4. failed to carry out activities conducive to glacier and periglacial environment protection. To the surprise of the scientific community, the indictment also included the former head of Argentina’s Glacier Institute, Ricardo Villalba, ironically, one of the author’s of the Glacier Law, for his failure to adequately inventory Argentina’s glaciers. Not only is the glacier inventory long overdue, but it has failed to prioritize areas with potential conflicts (such as mining or oil/gas projects) and the IANIGLA decided to only inventory glaciers of more than 1 hectare, when the Argentine Glacier Law mandates that all glaciers irrespective of size and form, be protected by law. Casanello says, that means the IANIGLA should inventory all glaciers, and not just the bigger ones. The IANIGLA should have completed glacier inventories at all mining projects underway as of October of 2010, and it had 180 days to do so. Thus far, no official government documents accounts for the state of any glaciers or periglacial areas any of the mining projects known to be in the works. Incredibly, in an age of rapidly melting glaciers, Argentina’s Glacier Law, now in its 7th year of implementation, is the only law anywhere that specifically protects glaciers and periglacial environments (large swaths of frozen ground generally below the glacier line and above the forest line). The law also prohibits mining and oil/gas projects in glacier and periglacial zones. The Glacier Law was a big victory for environmentalists and a major blow to the mining sector in 2008, when it was first passed unanimously by Congress following incisive contribution in support of the law of Argentina’s then Environment Minister Romina Picolotti. Picolotti had been unsuccessful in intervening in controversial mining projects to carry out federal environmental controls. In Argentina, mining and natural resources are under provincial jurisdiction. A career environmentalist, and very keen to project cryogenic (ice) resources, as Minister, she saw to it that the Glacier Law passed Congress effortlessly and also ensured the survival of Article 6 of the law, which expressly prohibits mining and oil/gas operations in glacier and periglacial areas. No-one in the mining sector saw it coming, nor did they know then that provinces such as San Juan and La Rioja, very rich in mineral resources are also rich in glaciers. The mining prohibition in the Glacier Law placed at least a dozen, and perhaps many more mining projects in the high Central Andes, under the chopping block. Projects like Pascua Lama (Barrick Gold), El Pachon (Glencore Xstrata), Los Azules (McEwen Mining), Agua Rica (Yamana), and a dozen or so others projected above 3,500 meters in provinces like San Juan, La Rioja, and Catamarca, were all of a sudden on shaky legal ground. Immediately after the law passed both Houses of Congress without any opposition, Barrick’s then President, Peter Munk, contacted President Cristina Kirchner and asked that she veto the law or loose US$10 billion in foreign investments. Kirchner fumed at having to pay the political price of reversing a unanimously voted Glacier Law, and blamed Picolotti for letting the law slip undetected through Congress. 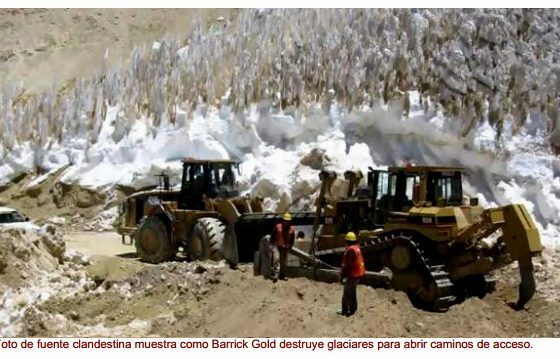 She nonetheless heded the Barrick request, for which her veto of the 2008 Glacier Law has become infamously referred to in Argentina as “the Barrick Veto”. In the veto, Kirchner explicitly states that she is vetoing the Glacier Protection Law to favor mining interests. Picolotti resigned immediately after the veto and turned her advocacy efforts to getting the law passed again. A social and political movement orchestrated by environmental groups as well as political opposition to the Kirchner government brought back the Glacier Law in 2010 by a slim vote in Congress, with mining provinces now sensitive to potential mining prohibitions in their territories. Since 2010, CHRE has produced a dozen reports showing mining project exploration and extraction occurring in glacier and periglacial environments, and has called on public officials to address these impacts and to abide by the reigning Glacier Law. The Executive Branch, however, has taken few steps in this direction, and has failed to intervene in any mining projects with glacier impacts. In Mendoza and La Rioja Province, two projects (Cerro Amarillo-Meryllion Resources and Famatina-Osisko) where stalled precisely due to glacier impact uncertainty. Several environmental groups, including CHRE, have approached the judiciary with complaints about impacts to glaciers and periglacial environments at a dozen or so projects in provinces such as San Juan, Catamarca and La Rioja. 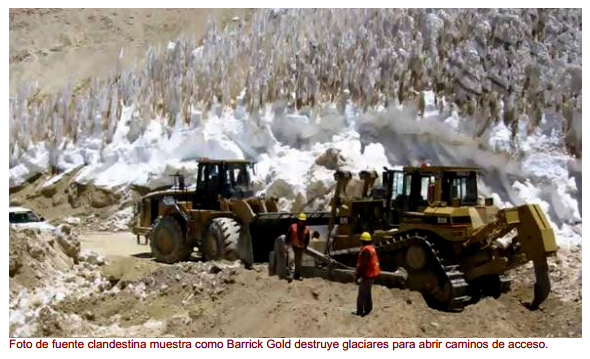 Barrick’s Veladero project (sister to the stalled and adjacent Pascua Lama project) has received particular attention not only because of the closure Barrick suffered in Chile of Pascua Lama since 2013 due to glacier and other environmental impacts in Chile, but also because of recurring toxic spills at Veladero. Amidst growing concern of environmental groups, the court has finally turned to the compliance of Argentina’s Glacier Protection and is going after responsible public officials for failing to adhere to the law and intervene in projects affecting these sensitive ecosystems. This does not bode well for current President Macri’s intentions to revive international mining investments and rumors that he is set on revising the Glacier Law to be more permissible on mining. 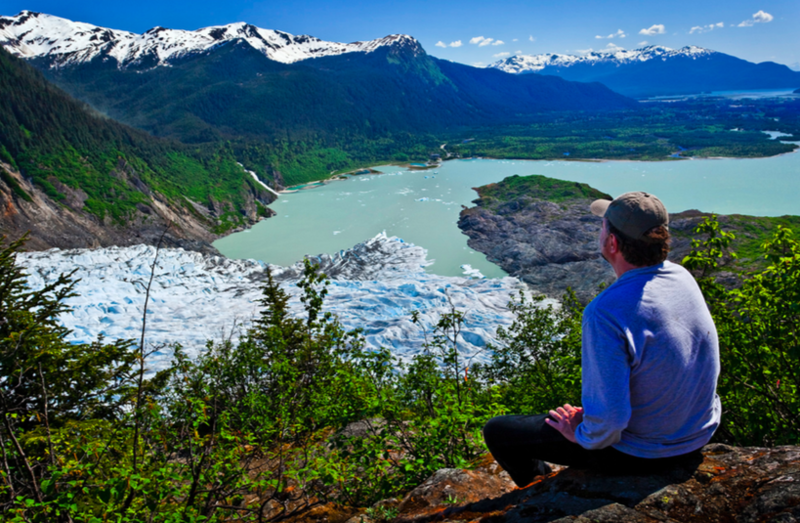 The indictment charges 4 public officials with violations of the glacier law as well as other administrative and criminal offenses due to their failure to ensure glacier protection at key mining project sites. The four charged officials are barred from leaving Argentina and must place a 5 million pesos bond on their existing property value (US$290,000) for the duration of the case.